Greenland is the land of escaping lakes. In the summer, when soot lands on the ice sheet’s snowy surface and the Sun begins to melt the snow, bright blue lakes form on top of the ice. Just as on land, the water seeks a way down. Sometimes, instead of carving surface channels, water trickles into the ice sheet through crevasses and vertical shafts called moulins. In the most dramatic cases, a lake can burst through a kilometer-thick ice sheet and rush to the bottom of the glacier in a forceful waterfall. There, under high pressure, water may help the glacier glide a little faster over the rock below. Just how fast, however, is the subject of an ongoing debate. Geoscientist Kate Briggs of the University of Leeds predicted that such lakes will advance from around 50 to more than 100 kilometers inland on Greenland over the next few decades. She presented evidence for this, based on a study she and her colleagues published earlier this year in Nature Climate Change, during a session at the 2015 European Geosciences Union (EGU) meeting in Vienna, Austria. If such lakes begin to cover more of the Greenland ice sheet, they could play a growing role in the speed with which it moves, Briggs said. However, there may be natural brakes built into the system. Physical geographer Jonathan Bamber of the University of Bristol commented during the session that lakes forming on the even thicker ice sheet in the middle of Greenland may not be able to escape all the way to the rock bed below the glacier. The deepest ice is under even more pressure and may resist the hydraulic fracturing that enables surface lakes to break through the ice sheet closer to Greenland’s edge. Briggs and her colleagues assumed in their model that the water did eventually reach the rock bed and that the additional pressure helped it speed up the ice sheet’s motion. Nonetheless, the net effect of how glacial lakes affect ice flow is “still very much an open question,” Briggs said. Other scientists installed GPS sensors for short periods deep inside the ice sheet to examine how it moves. They found a caterpillar-like movement in fits and starts, according to research reported earlier this year in the Journal of Geophysical Research: Earth Surface. It is useful information, but generalizing any local observation about the ice sheet is difficult: Greenland spans 18° of latitude and hosts differing microclimates, and its ice sheet encounters chaotic mountains and sea conditions at its edge. 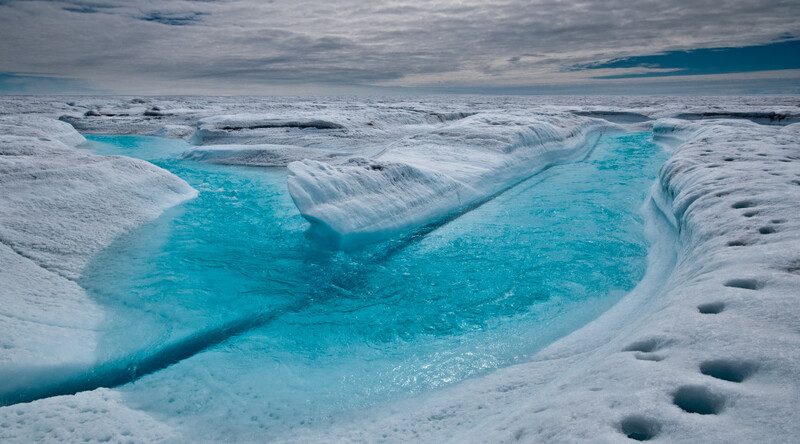 The ice sheet’s interaction with the Earth’s climate is complex, session speakers noted. Still, tracking its speed is a good place to start, explained ice sheet researcher Twila Moon of the University of Colorado Boulder. “Understanding ice velocity is fundamental to understanding how much ice we’re going to lose,” she told Eos. During the same EGU session as Briggs’s talk, Moon presented preliminary data from the Landsat 8 series. Some of Moon’s previous work shows that the ice sheet’s velocity changes over the course of the seasons and varies by location. Landsat 8 offers more frequent sampling than previous satellite ice sheet mapping: up to every 16 days. That means she will be able to create maps of the ice sheet’s speed with unprecedented time coverage. Perhaps, over the course of the season, Hewitt explained, water carves out channels below the ice sheet, and over time, more of the glacier’s weight settles onto the rock bed between the channels. That might explain why researchers have detected both speedups and slowdowns of the ice sheet after surface lake disappearances. The new density of time sampling will enable him and other modelers to put better limits on their models. Briggs and others also examine the ice sheet’s topography using radar from CryoSat-2. She presented some preliminary data on ice sheet thickness during her talk, including more evidence that some of the Greenland ice sheet is thinning in ways not captured by existing regional climate models. Similar to the GPS and optical data, the radar data raise more questions. It is tempting to argue that the growing density of aerial coverage could mean there is less need for slow, expensive GPS surveys, Moon told Eos. However, some of the finer movement, as shown by the GPS surveys, occurs on time scales too short for satellites to reliably detect. “We would need subdaily resolution to capture the sudden fits and starts,” Hewitt told Eos. “We won’t get that from satellites.” Instead, it may take a lively combination of more on-the-ground instrumentation, more remote sensing, and more modeling to see into the future of Greenland’s ice sheet and its disappearing lakes. First published by Eos: [html] [pdf]. Journalist covering global development by way of science and technology.